Parabolic surfaces can be used to concentrate energy for example to focus sunlight to heat things. Using an old World War II spot light mirror we demonstrate how easy it it is to concentrate enough energy to cause combustion. Finally, we show how to make a simple experimental version to safely explore solar heating. 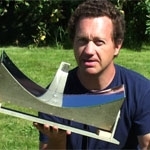 See the following link for details of making your own parabolic device. General Safety Warning: This experiment should always be undertaken with the supervision of a teacher. Never look at the focus or directly at the sun. Caution should always be taken when experimenting with heat and combustion. Visit the virtual science centre packed full of things to make and do!